Iraq's prime minister retired more than 300 officers as part of efforts to restructure the army after multiple divisions collapsed during a jihadist offensive last year, his office said Monday. 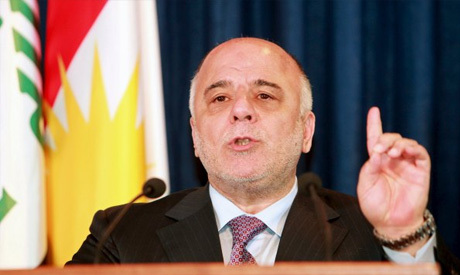 Haider al-Abadi "sent more than 300 officers at the defence ministry into retirement as part of a plan to reorganise the army and make it more effective and efficient," it said. The one-sentence statement did not provide details on the ranks and positions of the officers, or specifics on why they were removed from Iraq's massive officer corps. Abadi has removed army and police officers including senior leaders on several occasions, firing some and allowing others to retire, but this is the largest number to be sacked at one time. Multiple divisions fell apart in northern Iraq when faced with an offensive led by the Islamic State (IS) group last year, prompting the government to turn to Shiite militias to bolster its forces. Backed by a US-led coalition and Iran, Iraqi forces and allied paramilitaries dominated by Tehran-backed militias have retaken significant territory from IS this year. But pro-government paramilitaries have also carried out looting and burning as well as extrajudicial killings, raising concerns over the major role they play in the fight against IS.